The main reason you visit a glass-blowing studio on the Oregon Coast is to purchase some of the truly unique and beautiful artwork on display. At the Fernhill Art Studio, they also give you a show. When I walked into Fernhill the first thing I felt was the heat coming out of the furnace. At the time of my arrival, Claude Kurtz, owner of the studio, was making a lamp for an audience of about a dozen people. Kurtz has set up some stadium seating and his work area is recessed down below. Visitors when they walk in can stand or sit in chairs and watch him make some of the most amazing pieces of glass artwork. Kurtz said he blows glass all-day everyday so catching him working is as easy as showing up. He usually gets started around noon, because he has to get the furnaces warmed up. Blowing a glass, or doing an experiment like he was on the day I visited, takes him anywhere from 20 minutes to an hour. The amount of time he spends depends on the complexity of the project. “I was working on doing some different colors there, so took more time,” he said after he had finished. Watching the process is mesmerizing, realizing that the toffee-looking substance he is twirling and spinning is very, very hot. Kurtz said he took his first glass blowing class in 1989 and has been doing it ever since. He is always trying to get the perfect color or shape for his creations, and even though it is very hot – especially in the summer – being along the river does help to cool his workspace down. Molten glass is usually between 2,000-degrees and 2,200 degrees Fahrenheit. During the fall and winter months Kurtz sees the heat as a great advantage for people looking for things to do in Astoria. “They can come in here and get warmed up and dried off very quickly,” he said with a laugh. Kurtz sold off his part of a glass shop in Portland to get his new shop started three years ago and he said it has been getting more and more popular ever since. The daily shows help, he said. He said his most popular items were the floats – he even makes some for a local festival – and beer mugs. Visiting the store and making your own item, or even buying one of the items already made, gives you a unique keepsake of your trip. He carries everything from glass coins to vases, mugs and glass hearts or other sculptures. He also offers Oregon Duck and Oregon Beavers colored mugs – and during the different holidays you can get glass snowmen or glass pumpkins during Halloween. “Our pumpkins never rot, and our snowmen never melt,” said Chris Huke, Kurtz’s self-described lovely assistant, who also blows glass and helps with the classes and shop. Items in the store range from a few dollars to more than $500, depending on how much time and effort they take to make. “We try to have prices so that anyone coming in can afford something,” he said. About Fernhill Glass Studio: A glass studio up the hill from the Columbia River in the historic town of Astoria on the Oregon Coast. 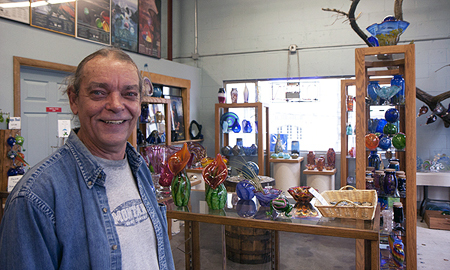 Claude Kurtz is the owner who has been blowing glass since 1989 and opened the shop three years ago. What to bring: It can get a bit warm in the shop, which is perfect for the fall and winter months. Comfortable shoes and if you are going to take a class make sure to follow the recommended clothing. Getting there: The studio is located at 1450 Exchange, Astoria. It is two blocks off of Highway 30 in downtown Astoria.